With an aim to stand tall on the expectations of our respected clients, we are providing wide assortment of Agate Reception Desk. Capitalizing on the skills of our dedicated team of professionals, we are involved in providing a premium quality range of Office Reception Desk. The offered Office Reception Desk is widely demanded by our clients for its fine finishing, high quality and appealing look. The offered range is quality checked by our professionals. We are provide Reception Counter to our customers at industry leading prices. We creatively fabricated these reception counters using quality wood that is procured from the reliable vendors of the industries. These Reception Counter are always preferred to flawless and standard quality. Vinar offers a wide range of Reception Counters to clients. Moreover, the range of counters is fabricated using the best quality raw material and graceful designs that enhances its beauty. Further, these are specially designed to add beauty to the decor and are widely appreciated for polished surface and clean cut edges. Vinar custom design the vanity tops as per the client's requirements. 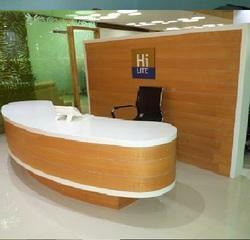 - “U shaped reception table in lacquer & laminate furnishes with defused lighting system. A warm Pearl family welcome and awaits you at the spacious lobby on the ground floor and there after lift will help you to the rooms. The reception tables offered by us are known for their corporate designs, construction and durability. Our reception table finds wide application in different companies and offices and is the true mark of the self-esteem and honor. These are offered in different standard sizes and shapes, which can be further customized as per the requirement of our clients. 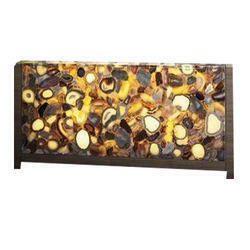 We are the manufacturer of Reception Furniture.